Over the past year, readers of my blog may have noticed my increased effort to eat locally by growing my own food in my home and community garden space. As I plan the 2012 season, I'm making a list of the fruits and vegetables I'll want to eat, choosing the seeds from my favorite catalogs like the Kitazawa Seed Company, and thinking about how best to plant them in my raised beds. Traditionally planting is done in long thin rows. If you fertilize and water a bed with a few long thin rows, you get a great crop of weeds and less than a maximum yield of the fruits and vegetables you want per square foot of soil. There has to be a more logical way, based on 3 dimensional thinking. 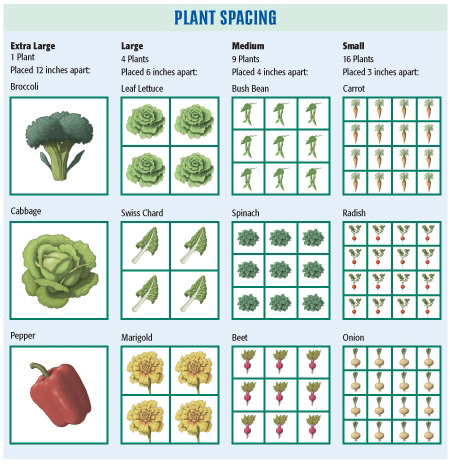 An innovative book, Square Foot Gardening by Mel Bartholomew logically examines the space and nutritional needs of various plants, enabling you to lay them out scientifically rather than randomly, per the graphic above. The end result is higher yields, fewer weeds, less watering, less environmental impact, and less work. This year, I'll be replacing a chunk of my front lawn with a series of 4x4 foot beds, filled with vegetables and flowers laid out via a Square Foot Gardening plan. Not only will I have more fresh foods for the table, I'll have less grass to maintain, so I'm canceling my 'mow and blow' service and buying a push mower. As I continue to strive for better personal sustainability and self sufficiency, Square Foot Gardening is one piece of the puzzle that adds to my efficiency. May I suggest the following, good sir? The Fiskars Reel Mower. No gas, easy to use and QUIET. This will be replacing my gas mower this next season. This is Kevin from the Square Foot Gardening Foundation. I've been working with Mel hands on for the past couple months and we're excited to see people all over the internet talking about SFG! Feel free to send us pictures of your garden when it's up - we'd love to see it! My wife and i started SFG two years ago and the first thing we did was buy that book. It was genius and worked like a charm. It was kind of neat to hear you mention it, because I didn't think many others did it - at least none in our neighborhood do it as yet. You are on the right track! SFG works well for my 3 4x8 front yard beds in Maryland. Mel's mix is a great idea, and you needn't follow the recipe too dogmatically. The Fiskars reel mower is a great tool. I like to mow my front yard early Sunday morning, and there is no risk of waking the neighbors with the Fiskars. If you're trying to make the most out of a small space, Check out John Jeavons who pioneered the French biointensive method in the 1970's in the US. I spent the summer in my new garden in CA digging 2ft trenches beneath my beds but it was well worth it. My yield quadrupled. UMASS will also test your soil for a song. I am thrilled with this book. I have already built 2 garden boxes and started planting. The book is very easy to understand and follow. I have never gardened before and now have no excuse not to. It even shows how people with limited space, such as an apartment can utilize this technique.